"Character Development with Academic Excellence" has been the guiding principle of the school in all its endeavours since its inception. The school strives to instill into the minds of the students the eternal and universal values of love, service, non-violence, compassion, discipline, truthfulness and the like through various means. The best of them being through personal example of the dedicated band of teachers who serve the students with a missionary zeal to see to it that they blossom in all aspects of human excellence, be it physical, intellectual, emotional, psychic or spiritual. To see the performance of the school in this aspect one must observe a student of the school - his discipline, his morality and his humility. While a lot of emphasis is laid on the character development of the students, this is in no way at the cost of academic excellence.The well-qualified and committed teachers leave no stone unturned to see to it that the outstanding academic excellence record of the school is maintained year after year. The school has been maintaining a 100% pass record with around 90% of them with first division, consistently year after year for two decades now. Around of 60% of students secure 90% and above. In class XII CBSE results of 2015 school was all India 10th rank and the year before it stood al 8th place national lavel. 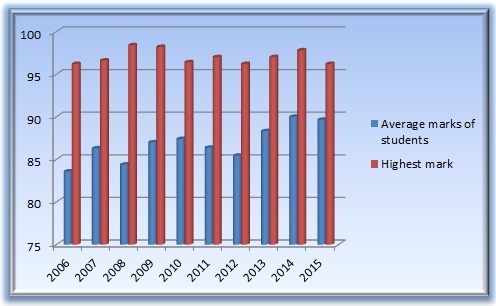 In the graphs on this page, you see the academic performance of the students for last 10 years.